BRATISLAVA (Reuters) – EU ministers took steps Sept. 23 to approve a contentious free trade deal with Canada, while France and Austria demanded that talks towards a similar agreement with the United States should stop. Both deals have triggered demonstrations by unions and protest groups who say they will spark a ‘race to the bottom’ in labour, environmental and public health standards and allow big business to challenge governments across Europe. 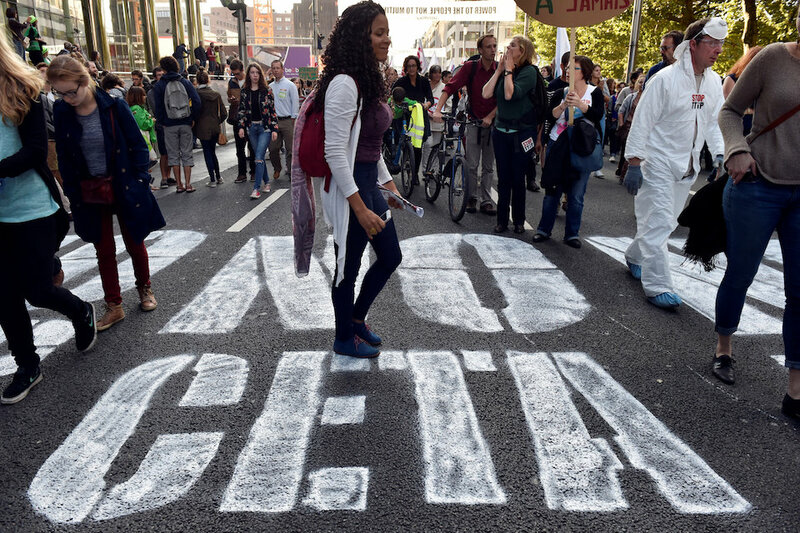 After a first session devoted to the Comprehensive Economic and Trade Agreement (CETA) struck with Canada two years ago but still awaiting approval, ministers agreed the two sides would produce a binding declaration that spelt out the limits of the pact to dispel public concerns. The ministers are expected to convene an extraordinary meeting on Oct. 18, allowing the deal to be signed during the visit of Canadian Prime Minister Justin Trudeau to Brussels on Oct. 27. It could provisionally enter force early next year. “There was a great willingness to sign the agreement in October,” Sigmar Gabriel, Germany’s economy minister and vice-chancellor, told reporters. Gabriel on Monday overcame left-wing resistance to the deal within his Social Democrats, the junior coalition partners in government. However, lingering doubts remain elsewhere, notably in Austria, where Chancellor Christian Kern’s Social Democrats have grave concern, and Belgium, where not all regions back the deal. Reinhold Mitterlehner, Austria’s Christian Democrat vice chancellor, said a declaration making clear that standards were not under threat and that a special court would not allow big business to dictate public policy would help. By contrast, Mitterlehner and his French counterpart argued that the EU-U.S. Transatlantic Trade and Investment Partnership (TTIP) talks, which have been going on for the past three-and-a-half years should be halted. The Austrian told reporters they should be relaunched after the U.S. presidential elections with greater transparency, clearer goals and a different name. The current process, he said, was doomed. Luxembourg and Slovenia also expressed strong reservations. Washington and Brussels are officially committed to sealing this deal before President Barack Obama leaves office in January. But their chances of doing so are remote given approaching elections on both sides of the Atlantic, with trade not a vote-winner, Britain’s June vote to leave the European Union and the calls for a fresh start. EU trade chief Cecelia Malmstrom said all ministers had expressed doubts a deal could be struck before Obama’s departure, adding it was “increasingly unlikely”. A next round of talks would go ahead in October and Malmstrom said talks could continue after the November election. “If we do not conclude TTIP before January 19, then there will be a natural pause,” she said, adding it was hard to say when they might restart. Some ministers spelt out the difference between concessions granted by Canada and what they said was U.S. intransigence. “If the Americans are not ready to meet at least the standard of CETA, with Canada, then there will be no chance of a deal,” said Gabriel. Finnish trade minister Kai Mykkanen said most of his peers preferred to let the Commission push on with talks, with an assessment of progress in November. He said a possible relaunch under a new president might need a new name. “There are so many unreasonable fears and maybe they are tied to the name TTIP,” he said. The name has become synonymous in many people’s mind with the evils of globalisation and big business. Outside the ministers’ meeting in Bratislava, around 100 local trade unions and Friends of the Earth activists held banners, mostly in English and German, denouncing CETA and TTIP. On the other side of the Danube river, Greenpeace unveiled a large banner on the top of a tower reading “No TTIP”.